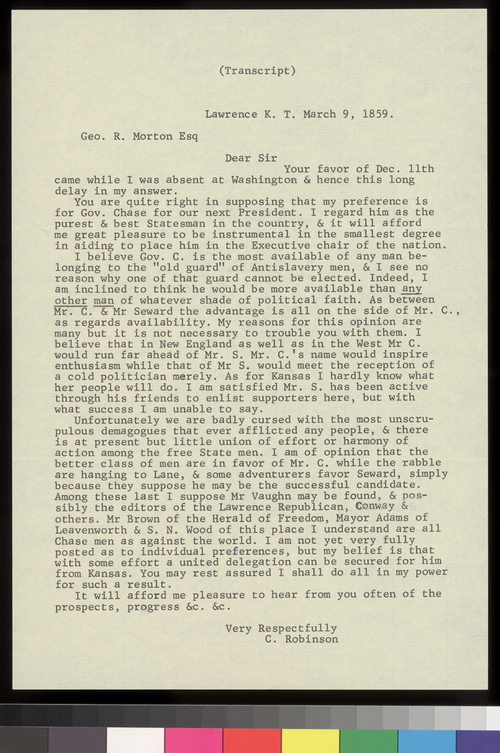 In this typed "transcript" of a letter from Lawrence, Kansas Territory, dated March 9, 1859, Charles Robinson confirmed Morton's apparent conclusion that Robinson preferred Governor Salmon P. Chase for president in 1860. Robinson considered Chase "the purest & best Statesman in the country," and thought he was "more available than any other man of whatever shade of political faith," including William Seward. Robinson also comments on the Kansas scene which was "badly cursed with the most unscrupulous demagogues that ever afflicted any people, & there is at present but little union of effort or harmony of action among the free State men."